It's been a week of exciting jewel discoveries and debuts, so it feels right that we're also introducing a new feature! Today, Kelly Lynch -- the blogger behind The Duchess Diary -- has selected her ultimate collection of jewels from the pieces worn by Princess Margaret, Countess of Snowdon. I challenged her to choose five of her favorite pieces from Margaret's jewelry box. In turn, I'm guest posting over at The Duchess Diary today, answering some of Kelly's questions about the history of Margaret's jewelry. Head over there for more! Kelly: This was not easy to narrow down, seeing as Princess Margaret’s collection was/is/always will be utterly gorgeous. 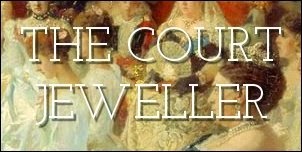 I never take the opportunity to chat about jewels on my site, so many thanks and advanced apologies to The Court Jeweller and her fantastic readers for indulging me in a bit of gem speak. Ella: No apologies needed -- this is a major challenge, and I think you've made some great choices! Kelly: I don’t normally wear them, but I love brooches and the way they pull an outfit together without making too much of a splash. The Lichen Brooch might be one of my favorite pieces owned by Her Royal Highness, who had a vast collection of glittering brooches. Ella: This really is a cool brooch, and I love its backstory -- in 1967, Margaret literally found a piece of lichen, sent it to Andrew Grima, and asked him to make a brooch using that piece as a prototype. I only wish I had the power to pick up a random natural object, send it to an important jeweler, and have it basically cast in gold and diamonds! Ella: I love the idea that royals select jewels to please/impress their hosts, and from interviews that various royal ladies have given, I know they definitely plan their jewels that way. This is a really great complete parure of turquoise jewels. It's set with diamonds and Persian turquoises, which is connected to the name I usually use for it, but the "Flames/Lamps of Love" name is also really evocative of the symbolism that Garrard built into the tiara. I am really hoping that Margaret decided to return this one to the royal vaults, as she (apparently) did with the Lotus Flower Tiara. Fun fact: the tiara was once a kokoshnik, with a thin, curved upper row of diamonds, but the Queen Mum removed that piece of the tiara. Kelly: The strands of pearls worn by royal women is often overlooked, mainly because it’s become a wardrobe staple we’ve come to expect each and every time they’re photographed. However, zooming in on the details and history of the pearls makes the necklace that much more enchanting. This strand (five graduated rows, it appears) of pearls with a diamond clasp was given to Margaret by Queen Mary on her 18th birthday, and sold at Christie’s for over $500,000! I would love to know more details about the clasp! Kelly: This is strikingly similar to Diana/Kate’s ring, save for the setting and the color of the stone. Admittedly I don’t look at Margaret’s hands as much as I look at her neck/head area (naturally) as those are where the most prominent jewels are, but this ring is gorgeous. Was it made for Margaret? I know her engagement ring was ruby. Ella: I haven't been able to track down much information on the provenance of the ring. The notes from the 2006 auction don't give any clues, which means it probably wasn't a gift from Margaret's parents or grandparents. Or maybe her children weren't sure? Jewel lovers: be like Queen Mary and keep meticulous records about when/where you got important pieces. You never know when you'll become famous and someone will need those notes! Kelly: According to your site, the tiara was made up of brooches given to Margaret from her new husband in 1960. What a fantastic idea. I don’t believe it was actually fashioned into a tiara until Lady Sarah Chatto’s wedding, correct? Sarah wears her mother’s brooches at several occasions, and it’s rather nice to see the next generation properly representing what - in time - will become priceless heirlooms. Ella: I believe that is correct -- Wartski, I think, was the firm responsible for fitting the brooches as a tiara. Margaret wore them in her hair, but they weren't used in tiara form until Sarah's wedding. Very fitting that she inherited them, and very sweet that she loaned them to her half-sister, Lady Frances, to wear at her own wedding. Which five pieces from Margaret's jewelry box would you pick for your Ultimate Collection?